An important factor controlling tree species diversity is conspecific density dependence (CDD). Adult trees associated with arbuscular mycorrhiza (AM) and ectomycorrhiza (ECM) can exhibit negative and positive CDD effects on conspecific recruitment, respectively. However, the extent to which these mycorrhizal associations affect spatial distributions of individual trees and their relative abundances within forests through CDD remains uncertain. We analysed changes in spatial correlations between adults and conspecific juveniles at different growth stages of five hardwood species in a 6-ha plot of an old-growth forest using a point pattern analysis. The clump sizes of large individuals were also evaluated using the Iδ index (a measure of individual dispersion) in 24 species. In two AM-associated species, juveniles were distributed at greater distances with increasing size or were always distributed at a distance from adults, resulting in small clumps of adults. In contrast, juveniles of two ECM-associated species were distributed close to adults during early or late growth stage, resulting in large clumps of adults. 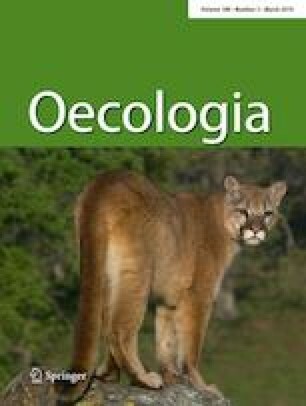 Juveniles of an ECM-associated species disappeared with increasing size, probably due to shade intolerance. In 24 tree species with large numbers of individuals within a plot, the relative basal area was related to both mycorrhizal type and maximum diameter, suggesting that the relative abundance of a species is largely related to its mycorrhizal associations and maximum plant size. This study strongly demonstrated that mycorrhizal associations play an important role in determining the spatial distribution patterns and community structure of tree species through CDD. Communicated by Edith B. Allen. The online version of this article ( https://doi.org/10.1007/s00442-019-04376-2) contains supplementary material, which is available to authorized users. We thank Yoshihisa Suyama, Kenichi Kano, Naoto Numano, Hiroshi Kanno, Naoto Ueno, Tomoyuki Sitoh, and Megumi Kimura for help with the field observations. This work was supported by a grant from the Ministry of Education, Culture, Sports, Science and Technology, Japan (K.S. No. 20380084). KS and TS conceived of the idea. TS, MK, YH, AI, MT, RN, NO, KM and KS collected the data in the field. TS, MK, YH, AI, MT, RN and NO performed the analyses. TS and KS wrote the initial draft. All authors wrote and edited the manuscript.